In 2011, a cubicle housing system with an internal feeding alley and external cubicles was built at the HBLFA Raumberg-Gumpenstein, Austria. The walkways were covered with walking alley mats. In summer, cows slipped more often due to the insufficient removal of dried layers of manure on the surface. 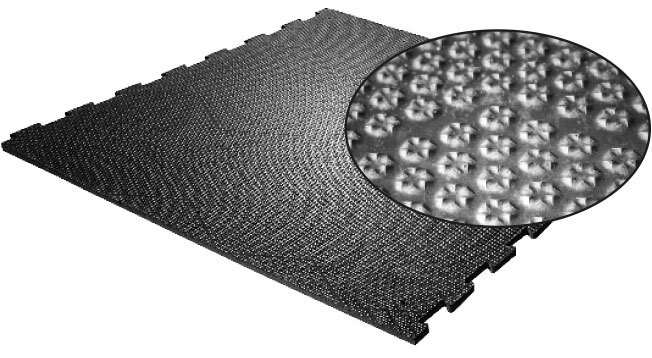 Because of that, on both outdoor walking alleys part of the area was laid out with walking alley mats with improved grip (profiKURA P). In summer 2015, animal movement was measured and evaluated. The cows move safely on the walking alley mats installed in 2011. On profiKURA P safe movement becomes even better. With about the same number of steps the cows slip considerably less and for shorter distances. If the cows slip more often in summer because of dried smeary layers on the walking alley, cleaning the walking alley with water helps. As soon as the animals have direct contact with the rubber, they are surefooted again.